'Germelwyn', the Leonard J. Busby estate designed by C.P.H. 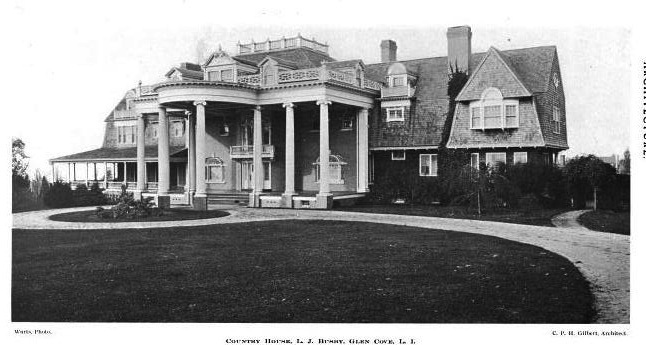 Gilbert c. 1896 in Glen Cove. Click HERE for more on 'Germelwyn' and to see it as it looks today. Click HERE to see the estate on google earth and HERE on bing. This is one of the loveliest houses I've ever seen. That an architect could create a work of such subtlety and grace, of such restful proportion, inspires me. The man who designed this is a worthy successor to Palladio. Sometimes we like things because they are not attractive in the normal sense of what attractive is, which is why I kind of like this house & stable. If someone described it I would be getting out the matches myself, but to see it – relatively intact & with a nice bit of acreage still around it, I sort of like it. 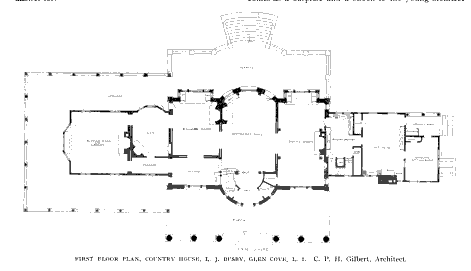 The floor plan is not too bad. Ground Floor: I know I questioned a previous CPH house for the dining room being the same size as the living room & note in this house the dining room is the single largest room in the house. I’m giving CPH credit for putting a half-bath under the stairs even though I’m not certain that’s what it is. I’m sure the veranda was a nice place to spend the day when it was all open & had a view of the Sound. Second Floor: Only one of the – I’m guessing seven second floor bedrooms, has a connecting bath; the other two bathrooms are in the hall & shared by three bedrooms each. But each bedroom appears roomy & has at least one closet. 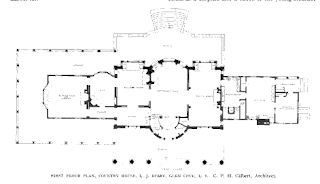 I’m mostly curious about the servants’ staircase – it appears to not be walled in on the second floor, just open to the floor even though there are no servants’ bedrooms on the second floor. Since the house is extant & not very modified I’m hoping someone can confirm this. Thanks. LOL DED, what words do you use to tell a woman that her clothing does NOT make her look fat? What a beautiful home, with so much history! Great find!! Hope you have a wonderful week! Germelwyn was named after Busby's wife and daughters: Ger(trude), wife MEL(vina) and WIN(ifred). 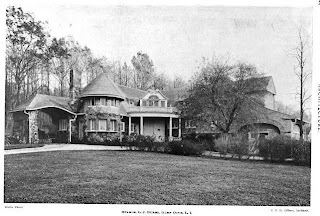 Following the Busbys' death, Gertrude and her husband Thomas Leeming, Jr., son of the Busby's Glen Cove and Brooklyn neighbor Thomas Leeming took up residence there. In the 1920's, Thomas Leeming, Jr., a prominent Businessman and Brooklyn civic leader was shot to death by his male "protege" who was attempting to blackmail him. Mrs Leeming made a half-hearted attempt to sell the place following his murder, but eventually took it off the market. She would remain summering there until her death in 1941. In the late 1920's, Mrs. Leeming hired what a relative referred to as a prominent New York decorator to redecorate her bedroom at Germelwyn. The relative sent me a wonderful photograph of Mrs. Leeming reclining in the resulting Art Deco bed, all done in greens and black and silver leaf, with a cerise silk lampshade on the bedside lamp. It was all in shocking contrast to the Edwardian interiors in the rest of the house. By the way, Thomas Leeming, Jr. Had the great good fortune on a trip to France in the teens of the last century to meet Dr. Benjamin Guey ( I may have the spelling wrong, but the story is right) and to Acquire the rights to his highly scented muscle rub. The Thomas Leeming Company was eventually sold to Pfizer in the late 1950's for some $40 Million (an astonishing sum at the time) and became the cornerstone of Pfizer's consumer products division. So ends today's history lesson. And DED- do I detect a note (tidal wave) of sarcasm? It is a rather odd house, but not without it's charms. And the gatehouse truly is a gem- I think it's one of the best things Gilbert did. My hand was halfway to the nitro before I realized what you were up to. "At the Summer home of Mr and Mrs Leonard J. Busby of Brooklyn the beautiful lawn covering fourteen acres was almost entirely destroyed last Sunday by the army worm. The worms came in the night and apparently there were millions. They ate the grass at the top only,not destroying the root. The prompt measures taken by Miss Busby and the gardeners on the estate prevented the spread of the pest to other places in the vicinity." "The worms came in the night...and apparently there were millions"
Again bias blurs ones eyes and mind to reality. THis house is one of Gilberts best country houses no matter what some people say. THe gatehouse complex is amazing, I agree with Magnus. I have been in the home over the years and one can easily view it from the road and it has incredible details and charm and despite the sarcasm, it is a gem of a home. Despite the heavy usage as a childrens camp/day school, it retains much of its former character and architectural beauty. Love all the angles, curves, columns, peaks, gables, bay windows, etc. etc, a feast for the eyes, that is for eyes that are not blinded by pre-conceived notions. The house is wonderful beauty which thankfully has survived and the floor plans are very well done. The gatehouse is charming. And I saw the picture of the house before I saw who designed it. I judge a building solely on its merits, no bias involved. Best is a very strong word. What makes this house one of Gilbert's 'Best'? When I look at it, I see parts which do not necessarily go together, which are not graceful, and some true oddities, like the spacing of the portico columns. And this has nothing to do with Gilbert being the architect. I'd feel the same way if John Russell Pope were the architect. The house may have a certain charm, no doubt, but it's also a busy and confused design. DFP I would venture to say the entire east wing was a service wing, perhaps with room for a nanny or a large shared room for maybe 2 house servants or it may have functioned as a nursery and school room, but those second floor rooms are in the servants wing along with the back stairs. 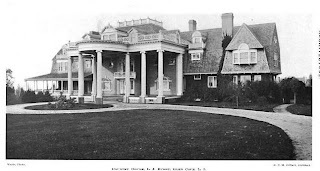 The house truly pulls out every colonial revival trick in the book and I'm fond of that two storey portico.